This signals that something is UP. I’m a furniture mover. 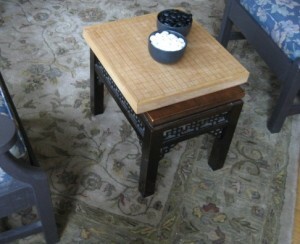 When I feel stuck, or life is overwhelming, or I just need fresh air, it’s always time to move the furniture. Starting something new often goes better from a new position. Writers will have heard many variations of the idea that a good way to break a block is to write at a different time, or in a different location or wearing a goofy hat. While I have a spacious office, it lacks natural light, and right now it’s full of tax records I’d rather not be bothered with. I need a change, a bright, accessible spot with no lists of scrawled numbers lying around to muck up the flow of words. Plus it’s so much easier to procrastinate this way. Hey, I have until the 18th this year so I’m livin’ it up. 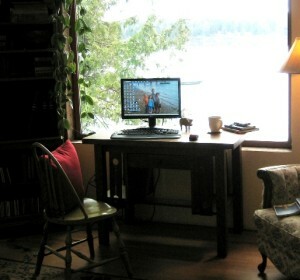 I set up my new writing station in the living room, centered in a window overlooking the harbor. I’m close to the stereo, the coffeemaker, the kitchen and the door for letting the cat out. The desk I’m using is one that’s been hiding in a corner of the kitchen, doing double duty as a garden planning and junk storage center. It’s a period craftsman piece that received poor treatment back in the 60’s or 70’s when antiques were so 1940. My Dad screwed a sheet of Masonite to the top and attached his vise to it. During my early years it lived in the basement and was always covered with tools, car parts and oily rags. I removed the rags, vise and Masonite years ago but the holes are still there. Patina. Since setting up in this new location, on this history rich surface, my work is so much nicer. For a while I’ve been feeling the need to up my game here at Tidal Life and in my column. Maybe it was just the winter doldrums, but the last few articles I’ve just been phoning it in. With spring here I’m looking to do a more thorough job on each piece. I’m also posting much more frequently and it feels better, more lively. I’m moving other writing activities to the forefront. With the current interest in e-books I decided to publish some travel, humor and food essays as collections for the Kindle et al. The first one should be ready next week. The cover, which was designed by my daughter Mari, is so great it makes me feel faint. I’m editing and polishing the pieces to make sure they measure up. Can fiction be far behind? This post is partly announcement of my publishing venture, and partly follow up for my Alice Almighty at Bohemian Hellhole. I promised her shots of my Bohemian version of waterfront living, which you will never see in the pages of Islands or Coastal Living. As long as you’re heaving large pieces of wood around you may as well heave a few more. So in addition to the desk arrangement I also put the Go board out where we can get to it, between a couple of comfy chairs. Looking forward to spending a couple of evenings trying to remember how to play.